David moved to Depoe Bay from Portland right out of high school to follow his dream of fishing on the Pacific. He was introduced to fishing at age four thanks to his Grandpa. David worked as a Deckhand on several different Depoe Bay charter boats through 80's until returning to Portland to raise his family while remaining in the marine industry. 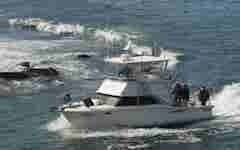 David has since returned to Depoe Bay to achieve his dream of becoming a charter boat captain. In April 2015 David received his Master Mariner Credentials, and started running the Smokin Reel, a six man boat. After two seasons he has now graduated to running the Hot Pursuit, a 43 foot Delta Charter boat that is the newest addition to the Dockside Fleet. 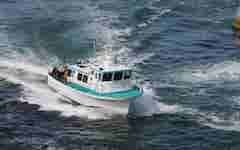 The Hot Pursuit will accommodate up to 14 for most fishing trips, doing Bottom Fishing, Salmon and Tuna. 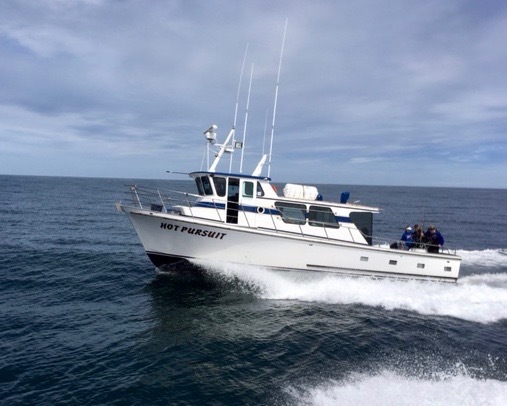 The Hot Pursuit, a Coast Guard Certified vessel, has all the amenities on board for passenger comfort and safety as well as a full complement of electronics. With his professional approach, along with a great personality, David strives to give every person a top notch experience, especially focusing on family fun. With experience gained as a deckhand in different fisheries David translates that into fun, productive trips. His particular passion (after his wife Kari) is Salmon Trolling and can often be seen on a "Personal Therapy Fun Trip" even after having chartered all day. Unfortunately, due to a rare but true allergy, David is not able to fish for halibut. He does however fish for all other species and is available year round and is a great fit with the Dockside team.